Last week, my family and I traveled to Texas to spend time with Dave’s love, friends and colleagues at the Euless PD Awards Banquet. It’s always unexpected to me how much it helps my soul to be around those who loved and respected Dave most. People who have that link to Dave offer a comforting place from which to experience the range of emotions we go through everyday as we somehow try to reach a “new normal” without him. The awards banquet was tough but also beautiful. We even met and heard about the actions of people who we didn’t even know had been involved in the tragic events following Dave’s loss. It seems to me that hundreds of people provided their assistance — besides the obvious, officers, EMT, hospital staff, nurses, doctors and more, there were so many businesses, organizations, and city administrators who made sure everything ran smoothly, or who donated their services. Our family had no clue, for the most part. So, just to really make sure we say it again: THANK YOU. 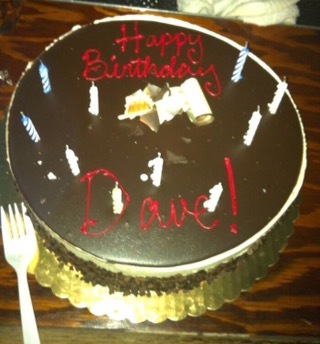 And, thank you, most of all to everyone who loved and continues to love Dave. Yesterday, my parents and I and over 2500 others participated in the NYPD Memorial Run to honor the legacy of of the 882 NYPD officers who have fallen in the line of duty. 882 souls who have given their lives to protect those of the citizens of NYC. It was a very moving experience. Beginning with an invocation by an NYPD chaplain, that was both poignant and humorous (delivered with a great New York accent! ), the singing of the national anthem by a female officer, and the mournful playing of the bagpipes during a moment of silence for our fallen heroes. Most striking to me was seeing all the personalized race bibs, many with names of the recently fallen, and many more graced with names of officers whose legacy endures even though they have left us long time past. “My brother” is what my bib said. Others wore bibs that marked their own relationship to an officer: my son, my husband, my partner, my father, my cousin, my friend, my hero, … The list goes on. Let us honor those who have left us, but let us also remember those who are left behind, for enduring their unthinkable loss. The officers, the families, the friends and supporters all deserve our deepest gratitude. I also want to mention that we understand that Dave is not an “official” fallen NYPD officer as he had retired and joined another department. Yet, there were close to 100 people there to honor him. Thank you to each one of you. There are so many people who are making a tremendous effort to make sure his sacrifice is honored in NYC as well. I want to take this opportunity to thank Bryan R. who has been at the forefront of these efforts. Thank you, Bryan, for all you’ve done and all you continue to do for Dave. And, thank you, to everyone who is helping with this in the background. We may not know each of you, but know that we’re grateful. Hofer Family with our Texan contingent! Thank you for being there! This post is long overdue, but know that we have thought of you every single day. These words are dedicated to Dave’s friends and fellow officers who were there with him on March 1st. You were there. You did everything in your power to save him. You were shot at. Yet, you moved forward in the face of grave danger without consideration of your own safety. You prevented the loss of more lives. You were with him in his last moments. Barely a moment to grieve, you’re already back out there again. In the aftermath of this terrible tragedy, you’re once again patrolling the streets, helping strangers, responding to more “shots fired” calls. You are heroes. My family knows this. You are in our hearts, always.